In any complex situation—i.e., in most situations—uncertainty is a given and certainty is a danger. Probabilities and surprises rule and possibilities and learning can flourish. So hold plans lightly, engage actively, value diversity, pay attention as things unfold, and nurture resilience and delight in the doorways opened by the unexpected. Uncertainty lies at the edge of mystery, of the unknown. I once mostly thought of uncertainty as a negative factor. I thought if we feel like we know things, then we will know how to move ahead, how to function effectively in life, and that people who don’t know fail or die. Knowing has survival value. That fact generates a bias towards feeling certain, latching onto certain data and holding it as “This is what is!” In many situations that works okay, particularly in small or mechanical situations. If something is wrong with your car and you know cars, you know what needs to be fixed and you fix it. That changes when you start getting into situations that are alive – like a human being, or a classroom, or a community, or a society, or an issue, or into something that’s not alive technically but is complex, like the weather. The weather is where complexity theory first started to form up because a scientist noted that very small changes in initial assumptions made a gigantic difference. This meteorologist was rounding up to four decimal points instead of five decimal points (or something like that) and the results of his weather calculations came out totally different. You’d think such a small change would only cause a small difference. But because of the feedback loops and iterations within weather systems, where conditions each moment influence what happens next which shapes what happens next, and so on, small changes can magnify in those systems and end up being very large. That observation generated a lot of inquiry which stimulated the emerging sciences of chaos and complexity. It is perhaps wise to start from a place of “We actually don’t know, in any absolute sense. We can learn to be more curious and open and constantly engaging with the realities we’re working with.” The aim is to accept uncertainty and to not stop prematurely. Psychological research shows that certainty is not something that is necessarily attached to information or understanding. It is simply an emotion. You can have an emotion of certainty when you actually are not operating on any data at all. So we can learn to realize that when we feel certain, it is just an emotion, and we can take it with a grain of salt. It can be dangerous to believe too much in our “certainties”. We are sure to overlook something because we are so focused over here, that we are not seeing what’s over there. Uncertainty is not, “I don’t know anything so I can’t do anything here.” It is simply not having certainty and being flexible in our perceptions of what’s going on, which allows us to continually scan our environment and reflect on what we want and where we’re going. There is a good chance of wise solutions arising out of that kind of mindful approach. I often say that probabilities and surprises rule. In any complex situation you’re going not to see certain things. Things are going to show up suddenly, sometimes for better, sometimes for worse. Suddenly something happens you didn’t expect – the supposed side effects that are not really side effects; they are just effects that you don’t like or didn’t expect that tend to be there in any situation that contains life. Wise use of uncertainty also involves not getting too dependent on linear thinking. Linear thinking is, “If we do this, then that is going happen”. And nonlinear thinking is, “If we do this, there is a certain probability that this or that will happen, but we should stay alert and creatively responsive, since we don’t actually know.” The more we know and the more systemically we think, etc., the higher the probability that what we want to have happen will happen. But there are no guarantees. You don’t know, in fact, whether you will wake up tomorrow morning. You don’t know, in fact, whether there will be an earthquake in the next couple minutes. We don’t know at a very fundamental level. The probability is that you are going to wake up tomorrow, and the probability is there will be no earthquake in the next 10 minutes. But we actually don’t know. So we operate on probabilities and recognize them as probabilities. We don’t act as if there are guarantees and everything is totally stable because then we get whacked up on the side of the head if things don’t turn out that way. Learning is a gigantic part of this. If we let go of our certainty, we will be better able to learn from what happens. Instead of just rejecting or accepting things in a black-and-white mode, we can learn the nuances and become more flexible through more flexible kinds of learning, and hold our plans lightly. There’s a leadership theory that I like. If people are looking to you for leadership in a situation, bring something into the situation that offers a structure to people’s thinking or planning or expectations, but hold it lightly. If you get energy from the people or energy from the situation that suggests your plan is not necessarily the best way to go, you can let go of your plan and go with the emerging energy. This can help you adapt appropriately. Go ahead and make plans, but hold them lightly and be responsive to what you get back from the world and from other people. 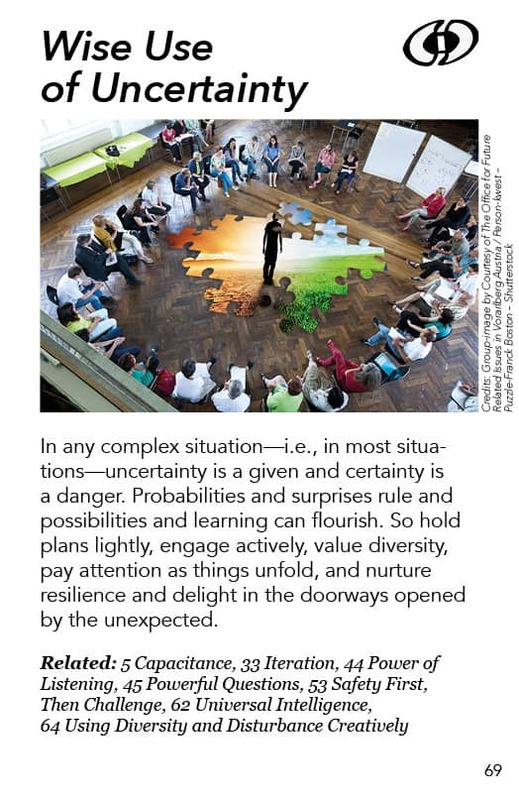 Now what does “valuing diversity” have to do with using uncertainty wisely? It’s about resilience. There is a dynamic tension between efficiency and resilience. Diversity and redundancy tend to impede efficiency. But if things don’t go as planned, having redundancy and diversity in a system gives you flexibility in dealing with the situation. The presence of diverse approaches, viewpoints, entities, people, species whatever it is, enables you to be more responsive. When you recognize uncertainty, when you recognize complexity and the dynamics of that, you intrinsically value diversity because it helps you succeed even though you don’t know. Of course you also obviously need to pay attention as things unfold. If you don’t pay attention you end up responding to what was rather than to what is. So that is another adaptive response to uncertainty. I already talked about “nurturing resilience” above. In times of uncertainty be happy to have redundancies in your system, to have things and people who are doing similar things, maybe with slightly different approaches. If you have five species of corn and a blight hits one of them and wipes it out, you still have four species of corn. If you have one species of corn and blight hits, it all gets wiped out: you are done, you don’t have any more corn. So that’s nurturing resilience. And what do I mean by “delight in the doorways that are opened by the unexpected”? I mean that, instead of surprise being a problem, surprise is a feature – as in, “Oh, look! That’s part of what’s going on, too! Wow, what fun could we have with that?” That moves into positive possibility thinking, which is also a pattern in this pattern language. So there are ways to be irritated and ways to be delighted by the same kinds of surprises. And of course the delight helps you enjoy things instead of being upset by them. I would love to practice all this more in my own life. I know these ways of looking at uncertainty and using it positively are quite potent to the extent that we can do them, individually and collectively. 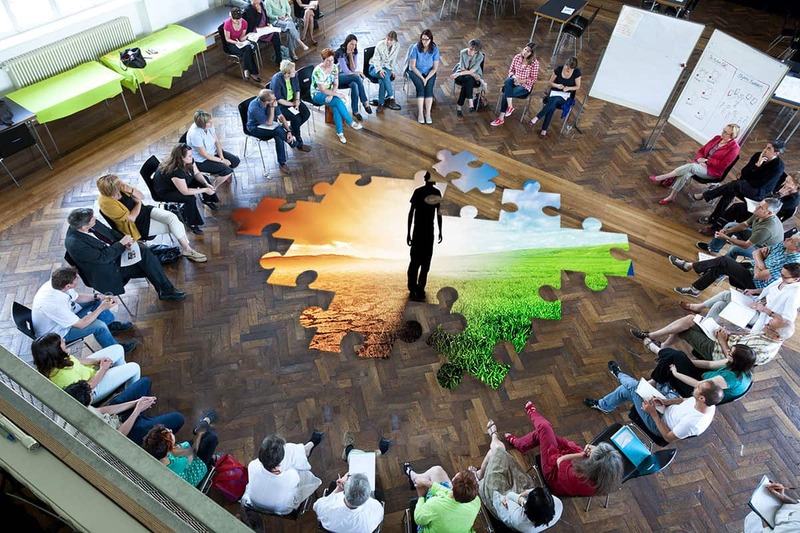 Scenario work – When I say scenario work, I am thinking primarily of a practice where you’re looking at various possibilities in the future and you are not attached to any of them. You are just exploring: “If it unfolds like this, how might we respond? If it unfolds like that, how might we respond?” Sometimes people use quadrant grids: “Here is a factor that may end up being very important or not very relevant or present. Let’s put that on the X axis. Now here’s another factor on the Y axis that may be dominant or could be very small.” This creates four quadrants of possibilities. Then you say, “Okay, if this quadrant manifested how would we respond? If that quadrant manifested how would we respond?” You are not planning. You are doing sort of an exercise: you are working out in a resilience gym. You’re doing your possibility work-out to help you think ahead flexibly. None of those scenarios may happen but the exploratory work helps you be flexible in the future. Humility, of course is not a method, it is an attitude, a stance in life. So humility is obvious. You don’t want to be arrogant. That blocks your ability to see what’s going on and respond appropriately. In order to be responsive you say, “I don’t know, but I’m trying to learn.” This shifts over to curiosity, which is the next one on the list here. As far as “feedback and systems thinking” go, the richer your feedback environment, the more you can handle the complexity that is usually associated with uncertainty and think systemically. Lots of bits and pieces are coming at you, and you dig around to find where they are coming from, what are the deeper dynamics, what’s the interconnectedness here. You’re not marching forward in a line. You are in a dance with what’s going on, paying attention to what your context is telling you about how things are related to each other. Now for “multiple viewpoints.” When you’re setting up a dialogue or deliberation, make sure you have different perspectives present, different stakeholders, and have briefing materials that represent truly different ways of looking at the situation that is being deliberated. I always think in terms of multiple viewpoints. Transition Towns is an effort to help towns be resilient in the face of economic or environmental shocks. They were originally formed to address peak oil. Suddenly the price of oil goes skyrocketing and a community finds it hard to get hold of oil, with long lines at the gas stations. How do you function as a community if you are deprived of the familiar sources of support from the environment, from the economy, from the various materials and energy sources that we take for granted? Transition Towns is moving beyond our dependence on those things and helping towns learn how to do that, how to live better without those things, with each other. Buddhism fits here because it has a fundamental principle that the only thing that’s real and dependable is change. So it can help you learn how to be unattached to the way things are or the way you want them to be. It’s fine to want things to be a certain way, but don’t have your deep self attached to that. Be able to let it go and flow on and say “goodbye” to whatever is leaving. That is a fundamental principle of Buddhism. So anybody who has Buddhist training or Buddhist philosophical thinking or experience will probably be more able to deal with uncertainty. Like Buddhism, evolutionary activism is based on the realization that everything is changing. It is a somewhat more scientific and activist approach than Buddhism, but it sees us as in the midst of a flow of change all the time. So who are we being and what are we doing in that flow of change? How creative and insightful are we being as evolutionary agents? As an activist you think, “I am playing a role in how things are unfolding and I don’t know where it’s going. I don’t know what the impacts of my life can be, or what my actions should be, but I’m going to live in evolutionary space and work as best as I can responding to what’s going on in ways that will probably make things better.” That’s the labor of evolutionary activism. Clearness sessions are a Quaker process. Somebody finds themselves at a point of not knowing what to do in their life. There is a crisis, a dilemma; they feel trapped, stuck. The Quakers use a Clearness Committee to bring friends together to help the person look at their situation, mostly by asking them questions (you can refer back to the Powerful Questions pattern) to help them look at what’s going on and find new directions, new understandings from within themselves. New possibilities come out in conversations with people who care about their friend and what’s happening in their life. So when you feel uncertain in a way that sticks you in life and you don’t know how to move forward, Clearness Sessions are a very powerful way of dealing with that. A much simpler approach many people use is Tarot, I-Ching or some other oracle. It is not so much that they are going to predict the future and tell you what’s going to happen. It is more that these are well thought out and intuitively derived mirrors or deep patterns within yourself and within your life. It’s sort of like looking at a Rorschach test. Here’s a meaningful well-designed pattern for you to come to and look at and sense into to see deeper parts or possibilities of yourself or trends or possibilities in your life that you may not have noticed. It is a stimulant, when living with uncertainty. It’s like you have this good friend that is printed on these cards and in these books to talk things over with. That’s how I look at the oracles and use them to explore my own personal uncertainties.